Team members at the Coast Dental headquarters in Tampa, FL donated blankets, personal hygiene items, and baby supplies to the Hillsborough County sanctuary for abused adults and their children. 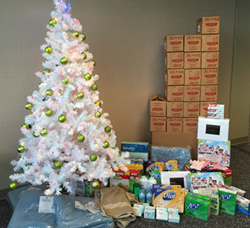 Coast Dental team members donated toothbrushes, toothpaste, personal hygiene items, baby supplies, and blankets to The Spring of Tampa Bay on Dec. 23, 2015. Coast Dental is known for helping people smile and during this holiday season, its team members found a new way to make a difference in the community. Its team members at the corporate headquarters in Tampa donated much-needed items to The Spring of Tampa Bay. The Spring is the Department of Children and Families (DCF) certified Domestic Violence Center for Hillsborough County. Since it was founded in 1977, The Spring has provided sanctuary and services to more than 60,000 abused adults and their children. Coast Dental team members donated 1,000 toothbrushes, 500 tubes of toothpaste, blankets, sheets, towels, soap, shampoo, diapers, baby food, and personal hygiene items to help the residents of The Spring. The company is excited to be part of the assistance that The Spring provides the Tampa community every day. This is just one of the ways Coast Dental gives back to the community. Many of the company’s doctors, hygienists, and team members participate in mission trips overseas and contribute to fundraisers and charity events at home. Team members and patients at nine Coast Dental-affiliated offices in San Diego donated 400 teddy bears to Rady Children’s Hospital this month. Through ways big and small, the Coast Dental team makes a difference in thousands of people’s lives every month. For more information about the company, its locations, and special offers call 1-800-32-SMILE or visit CoastDental.com.